Established 1964 - Andertons Music Co.
From our Guildford store and online musical instrument shop, we offer musicians a huge selection of guitars, amps, drums, pianos, keyboards, synthesizers, recording equipment, PA systems, music accessories and more - all at competitive prices. 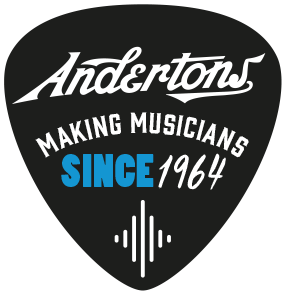 Founded in 1964 by current Managing Director Lee Anderton’s Father and Grandfather, Andertons Music Co. has remained a family business for over half a century. 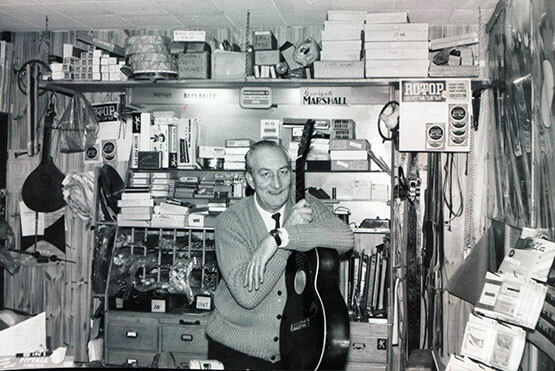 The store was primarily a place where local professional musicians could go to find the gear they needed, however over time Andertons Music Co. has become a globally recognised brand. With a reach extending well beyond the British Isles, we provide equipment for musicians of all ages and disciplines! As a result of the explosion of rock ‘n’ roll in the 60s, caused by bands such as The Beatles and The Rolling Stones, the demand for musical instruments grew quickly due to the popularity of this guitar-driven music. In the middle of that musical revolution, Andertons Music Co. catered for an ever-growing community of musicians, with a number of famous faces stepping through the shop’s doors. Continuing to grow in the 70s and 80s, with rock a mainstream staple in the charts, the music scene in Guildford reached its peak and Andertons Music Co. were there to support local musicians. Despite our premises moving several times over the years, the Surrey town of Guildford has always been the true home of Andertons Music Co. The current store has been based at Woodbridge Road, Guildford since 1990. In a more accessible area of the town, our shop is just a stone’s throw away from the main train and bus stations in the centre of Guildford. The location of Andertons Music Co. also makes it an easy drive from large cities in the South of England, and is just under an hour away from Central London. Moving into the 00s, Andertons Music Co. became a more established name in the music retail industry thanks to the rapid growth of the internet and our website, which has helped to increase the worldwide presence of Andertons Music Co. With the local Academy of Contemporary Music (also in Guildford) gaining traction in the mid-2000's and becoming a popular destination for aspiring musicians to study rock and pop music, Andertons Music Co. have continued to support students with the gear they need - also offering a generous discount! Undergoing a large-scale re-fit in 2011, Andertons Music Co. was given a fresh new look. Expanding our premises, improvements to the store allowed us to efficiently accommodate for each of our dedicated departments – Guitar & Bass, Drums, Keyboards and Pro Audio. With dedicated practice rooms, a spacious store layout and plenty of stock on hand available to try, we pride ourselves on delivering the best possible experience for our customers. Now an established international online retailer, selling gear from almost 400 brands with over £10.49 million of gear in stock and ready to ship, we are able to deliver all over the world! The success of our popular Andertons TV YouTube channel has improved our status and reputation greatly. Uploading our first video in early 2010, our product demos serve as a great source of information for musicians who love gear. Garnering millions of views and thousands of subscribers in the process, our videos aim to inspire, inform and entertain, and we have become an established part of the online gear community. In 2017, we decided to branch out with our YouTube presence and created independent YouTube channels for each of our departments. This shows that at Andertons Music Co. we care about delivering content for all musicians.